Saturday, the Portland Art Museum will play host to sculptor Richard Rezac’s work for a second time. The museum’s 1985 Oregon Artists Biennial debuted Mr. Rezac’s work 11 years after graduating from PNCA’s BFA program. 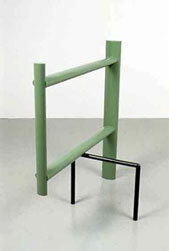 Twenty-one years later, he is back with a selection of sculptures and drawings from 1998-2005. A winner of this year’s Rome Prize for visual arts, Rezac is known for his modest constructions that reference architecture, religious paintings and hand tools. Really Looking forward to this show... it's strange stuff somewhere between Matthew Barney, Richard Tuttle and a mechanical engineering contractor (though it's all hand made)! from the Ovitz Family Collection, Los Angeles at Reed's Cooley Gallery. This is an excellent show. Richard Rezac spoke at the opening, in conversation with Bruce Guenther. Bruce was a perfect foil, saying very little but pushing Rezac toward fundamental issues, such as the relation between drawing and sculpture (Rezac's use of drawing is similar to an architect's), the way the pieces relate to the body, especially Rezac's own (his hands make everything, expressing a precision that is not mechanical but bodily), and Rezac's use of color (Rezac said it was secondary, that he chooses colors that will not interfere with the object's forms and materiality, but his color sense is nevertheless exact and essential; the wrong colors would have entirely undermined the sculptures; also, the scultpures work perfectly as paintings). Rezac is a compelling speaker, very dry, exact, and quiet. His coolness and quietude were also funny, and he got in some entertaining tussles with the very engaged audience members who pressed him about the tactile and sensual qualities of his pieces. It was like hearing a turtle talk about his experience inside a shell. I'm curious what others who were there thought of the evening. I thought it struck a perfect balance between the work and the artist. It is an excellent show and was a very gratifying opening. Richard Rezac does have a quiet presence that is made real in his sculptures, though, no literal turtles are to be found. I like Mr. Guenther’s curatorial procession with this series. In this context, Mr. Rezac’s work seems to conspire with his predecessor in the space, Roxy Paine. Is there a deliberate program at work or is this just a coincidence? Mr. Rezac did seem bewildered by the desire on the part of some members of the audience to touch his work. It seems that his obvious touch and the marks made by the low-tech means within his studio facilitate a response within the viewer’s body to resolve those issues of surface. This tension is what makes the austerity in his work so inviting and warm.